FAUST will play at Rock'n'Roll Arena, Romagnano Sesia (NO, Italy) on November 19th 1013. FAUST will play at Vacchen in Rogno (BG, Italy) on June 22nd 2013. FAUST will play at Centro Giovani Connection in Bressanone (BZ, Italy) on March 16th 2013. FAUST will play at Blue Rose Saloon in Bresso (MI, Italy) on April 19th 2013. FAUST will play at Liviera Rock Live in Schio (VI, Italy) on December 15th. FAUST will play at the Peaks Of Death Festival in Aosta (AO, Italy) on July 27th. FAUST will play at H.M. Club in Catona (RC, Italy) on June 17th. FAUST will play at New Dream in Maddaloni (CE, Italy) on June 16th. 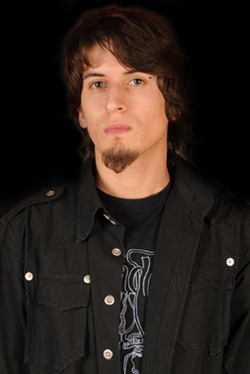 Izio is the new guitarist of FAUST. FAUST will play at Closer in Rome (RM, Italy) on June 15th. 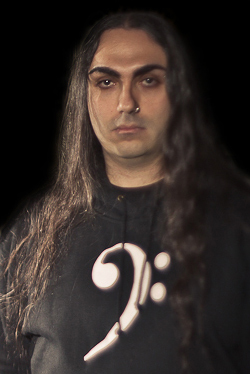 After the release of the Evolutionary Death Metal album "From Glory To Infinity" with the great Steve DiGiorgio on bass and the “human drum machine” Darek 'Daray' Brzozowski (Dimmu Borgir, Vader) on drums, FAUST is preparing for live dates expected for spring 2012. For this new series of concerts the band will perform with a new line-up: joining the band, along with the founding member Aleister, is Emi, bass player of the tech death metallers Illogicist. Stay tuned!